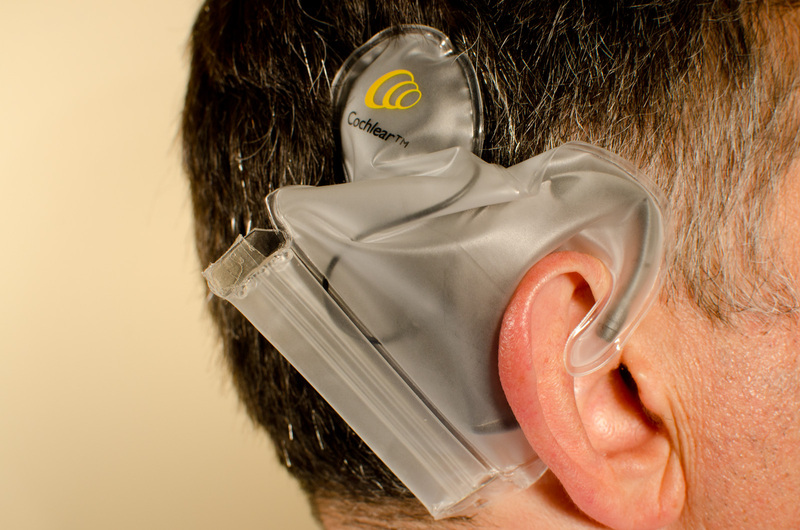 The Cochlear Aqua Accessory is now available in Canada, and your team at cochlearimplantHELP.com has acquired a box of 30. CochlearimplantHELP is proud to present the world’s first review of the Aqua Accessory! The box has an easy-open thumb tab with perforations. Slide the drawer out for a summer of aquatic fun. The Aqua Accessory itself (c’mon, Cochlear is great at coming up with names, how about something more catchy for this?) is made of a very soft plastic. The closure works like a Ziploc® bag, but the plastic is much stiffer. Be careful when you open it. It is easy to get the wrong side of the closure and rip the soft plastic part. The manual shows graphically how to use the Aqua Accessory. Insert the headpiece cable first, followed by the body of the processor. Seal the closure, then peel the tape off and fold over the sticky flap. The headpiece extension is long enough to accommodate users whose headpiece is very far away from the ear. Most users will find that the headpiece is closer to the ear than the maximum distance. 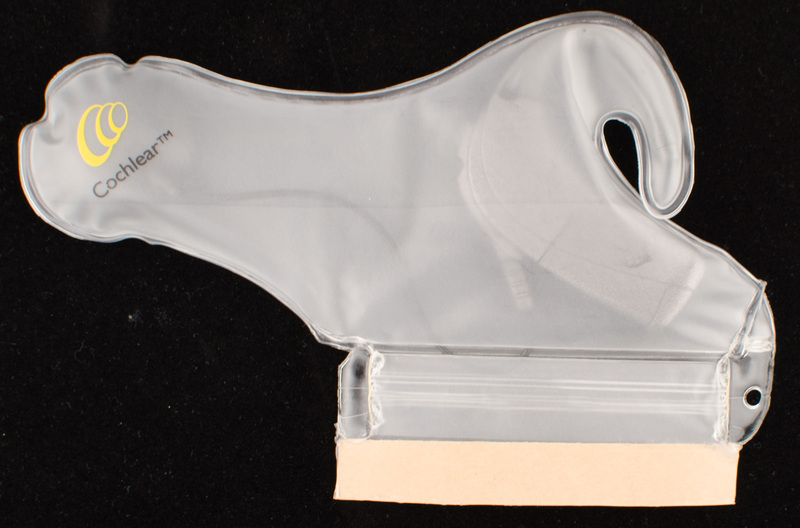 The soft plastic folds nicely to accommodate a wide range of headpiece locations. Inserting the processor is definitely best done by parents. 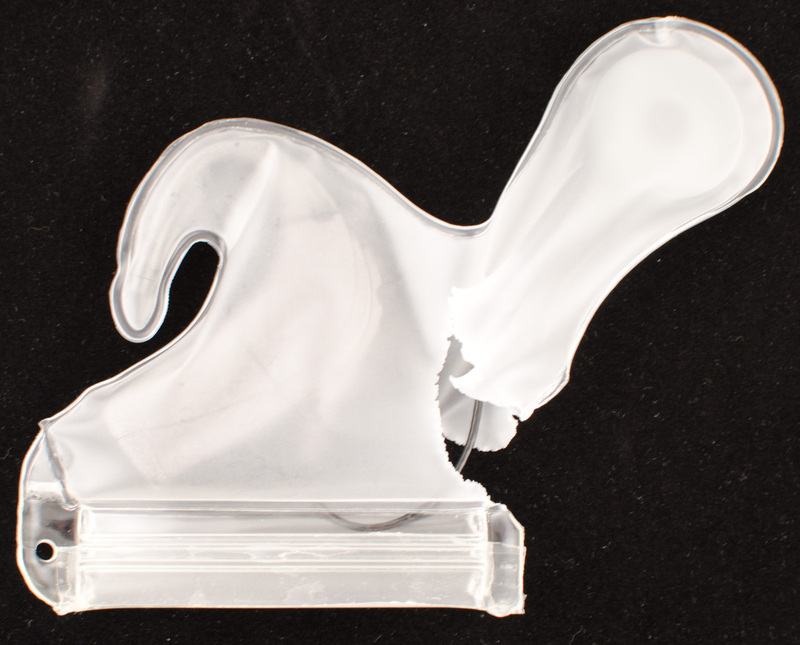 The combination of potential rips when opening the Aqua Accessory, plus the difference in stiffness between the closure and the bag, make it difficult even for an older child to follow the procedure correctly. Step 7 instructs you to surf, swim, shower, windsurf, waterski, and go sailing. It may not be necessary to participate in all of those activities each time you use an Aqua Accessory. But it certainly would be fun to try! It isn’t clear from the instructions if you are supposed to wear a swim cap, as in the photo of step 7. If you don’t wear a swim cap, it seems that the whole assembly would fall off pretty easily. The last page of the manual shows a clip to secure the Aqua Accessory to a collar. The clip is not provided in the box. Since this sort of clip isn’t readily available, Cochlear should provide one! A swim cap is probably sufficient, but a clip will provide extra security. Presumably this means that the processor is covered for water damage. But the processor manual does have limits on what is covered for water damage. Hopefully this will be clarified, and the company will warranty any water damage at all when using the Aqua Accessory. The Aqua Accessory is large enough to accommodate an Advanced Bionics Harmony processor, currently the largest BTE processor on the market. Presumably it can also handle MED-EL OPUS processors. This configuration includes the adult size T-mic and the PowerCel Slim battery. Notice that the headpiece cable makes a rather sharp turn shortly after exiting the processor. My headpiece is at about an average distance from my ear. The Aqua Accessory must be folded for the headpiece to fit over the internal magnet. The added thickness of the bag does weaken the magnet strength a little bit. You may want to add a magnet, but the swim cap is probably sufficient to hold it all together. The inside of the earhook is a potential region for irritation. It doesn’t hurt when worn for a short period, but it is definitely noticeable, and may cause some soreness if worn all day at the pool or beach. You should probably check your child’s ear for redness frequently until you are comfortable that it is not a problem. When wearing the processor in the Aqua Accessory, the sound is slightly muted, almost as if you are underwater already. But it is a small price to pay to be able to hear while swimming! The change in sound quality will probably not be noticeable after wearing it for a while. The instructions specify that the Aqua Accessory is a single-use item. It seems to have been designed to enforce that. Unless you carefully cut the fold-over flap, the only way to get the processor out is to rip the plastic open. 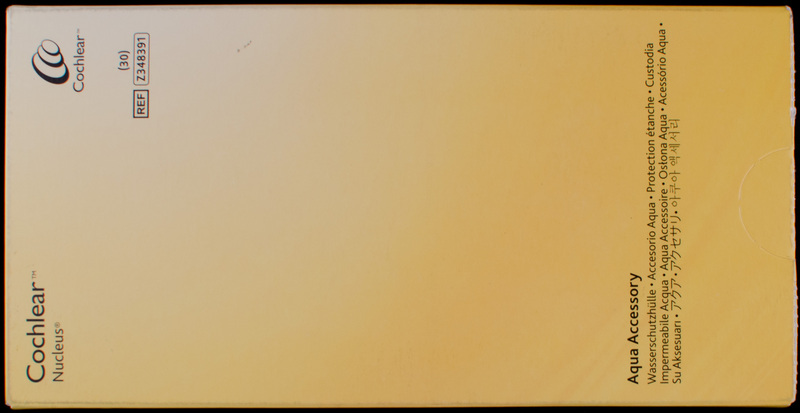 As shown in figure 8, start at the notch at the very back of the Aqua Accessory, and rip it just enough to be able to extract the processor carefully. Again, this is probably best done by parents. The Aqua Accessory will definitely allow kiddos to swim with friends and to take swimming lessons. It is a bit of a procedure to set up, and you really do need the swim cap all the time. While it may be fun to try in the bath a few times, it probably won’t become part of the daily routine. As of the time of this post, the Aqua Accessory is available only in Canada. Check with your local audiologist or with Cochlear to stay informed on when the Aqua Accessory will be available in your area. CochlearimplantHELP does not sell anything and cannot provide Aqua Accessories.